My Zomblobs! is a game designed in shells. There are layers to the design, allowing for a “bird’s eye” game experience with little micromanaging, all the way down to a Civilization-like world conquering game with a Tactical RPG layer, between them plenty of opportunities to min-max your way into gaming geek happiness. I’ve thought on more than one occasion that it could also be developed that way. As in, develop the outer shell as a functional game and iterate down through the shells until it’s ready to weld to the TRPG (which could also function on its own) as a complete package. Some of those iterations can stand on their own as playable games, perhaps even marketable ones. This does spread out the work and allow for monetization to keep a project going, and even allows for design changes if it’s found that one of the iterations or directions isn’t playing well. It also runs the risk of oversaturating the IP, making releases too disparate (in theme and/or release date) and therefore too easily ignored, getting lost in a crowd of shovelware (or becoming shovelware), dev team turnover, and code bloat. There’s also the risk that all the shells may not play nice together if they have to bend to accommodate separate releases. Still, there’s something appealing about the notion of breaking up a larger project into smaller bites to make it more manageable. I’m not really sold on either approach at the moment, but it is still interesting looking at options. The iPhone market and even XBox Live have allowed for smaller games to have decent viability in recent years, and I instinctively want to leverage that to make something bigger. It’s a business sense that I haven’t honed very well, to be honest, but one that I can’t quite ignore. I’d love to focus purely on designing the game and doing art for it, but the sad reality is that money makes the world go ’round, and if I want to turn the time I’ve spent on this into money (which really would be nice), I need to look at the business side of things. On the other hand, since this is a one-man show at present, and I don’t have much programming ability or money to hire some, well… this may well all be academic anyway. Sure, I’d like to learn the programming someday, but there are only so many hours in the day. Still… dream big or go home, right? 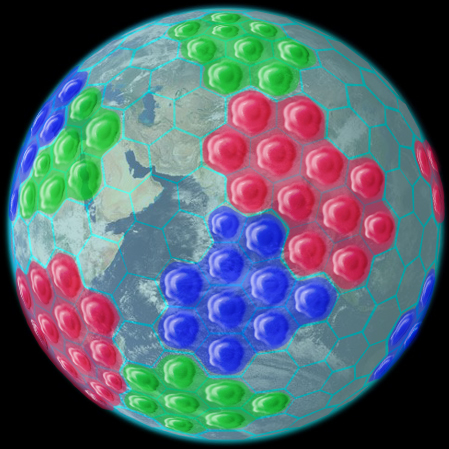 Of course, from there it’s possible to drill down into discrete blobs with hit points instead of instant-capture, species-specific boons and weaknesses, location-specific special effects (with real world GPS twists, perhaps), progression mechanics (sometimes mistakenly called “RPG elements”), resource management, research trees and even stories. The full Zomblobs! game would then only be a hop skip and a jump away, pulling all the elements together in a tighter fashion and welding them to the tactical game. There’s a lot I want to do here, and there are good reasons to limit the scope of any single project. Absent an organized plan of production, things can get hairy fast. I’m still not sure what I’ll even be able to do… but it’s good to at least make sure I look ahead. Forewarned is forearmed, and all that rot. Would you buy a game that’s effectively a “slice” of a larger game? Would you just expect it to be a sort of neo-shareware, offered for free, and the other layers monetized underneath for those who care to dig deeper? Would you like a suite of games that work like cogs in a larger machine, or would you just want the larger machine? Could you wait for new pieces? …are any of you bored programmers with an itch to work on this? …would a publicly readable wiki on the design be something worth making available? …would Battle for Wesnoth eat my lunch anyway? …EDITED to add the following great link to The Rampant Coyote’s recent article on “Feature Creep”… a highly relevant article as I sort out exactly what I want to do here. World of Warcraft finally steals the WarHammer Online “perpetual limited free trial” hook. Too little, too late, says I. The time to flank the F2P tide was a couple of years ago if not earlier. It’s still probably a smart move. It will be interesting to see what effects it has. As for me and my house? I’ll have a new baby Druid to play with when the itch strikes, and I don’t have to plunk down a sub for the privilege of picking up the game whenever I darn well please for a bit of sightseeing. Oh, and I can patch the blasted thing without feeling like I’m wasting a couple of days of a month’s sub or firing up a new dummy trial. …and I’d still pay for an offline version. If we’re going to lean in the direction of players being content in MMOs, and if we’re going to try to incentivize that with kickbacks, discounts or perks, we should probably get rid of levels and other barriers to playing together… and actually let the players generate content in a dynamic world, in addition to facilitating their ability to play together. Incidentally, Whirled does this pretty well, though under a *gasp* free-to-play system that lets players generate their own content that can then generate revenue. Weird, I know… but another illustration of how the fantasy-steeped level-then-raid two-game paradigm isn’t the One True Path to MMO design. Of course, since people can also sometimes be the worst part of MMOs, and many aren’t all that interested in good game design, there are dark sides to opening the floodgates. Still, if the goal is to encourage player interaction, even going so far as to bribe them, that would probably work best if the moment to moment play of the game supported such a goal. Oh, and this is a good excuse to bring out one of my favorite MMO developer quotes again. Every player, free or paid, adds value to the community and excitement for other players. Free players are the content, context and society that encourages a small fraction of the audience to willingly pay more than enough to subsidize the rest. Incidentally, there’s an interesting discussion raging over on the Escapist forums about Valve’s theorizing that kicked this discussion off. I kinda like the idea, maybe I’m a little impartial because I have a really magnetic personality and general can get a dead silent server to chatting like best friends in 10 minutes. But I would definitely love to get benefits for just being myself in games. What about the intangibles of being social and liking what you’re doing? As in so many other things, if you try to engineer good behavior with extrinsic rewards, you might get it, but the rewards have to keep coming and even get better. The gravy train can’t stop or you get withdrawal and bad behavior. People aren’t doing the right thing because it’s right, they are doing it because it benefits them. Once again, it’s a selfish motivation, not a selfless one, a completely mercenary approach to socializing. That’s one of the big problems with forced grouping in MMOs, by the way. First of all, levels in a PvP game are a Bad Idea. Player skill should be paramount in PvP, not avatar level grinding. WAR is broken on a fundamental level because of this. Not to be too pointed, but I think it’s actually a Good Thing to get everyone up to the level cap faster, since that’s where the playing field is more level… class imbalances aside, of course. Secondly, this is pretty clearly a nonexclusive item. Players who get riled up about someone getting ahead can just go grind to catch up. As such, it’s not about the sale item itself, it’s about someone else having something that you don’t have yet… or in the case of level capped characters, it’s whining about someone else not having to walk uphill barefoot in the snow to reach the vaunted upper echelon of the game. If you’re not having fun with the game, and have to denigrate someone else to feel superior, grow up. Fifthly, I’m tired of the “those dirty capitalists” arguments, whether they are leveled at the producers who are running a business or those dirty, dirty people who have money to burn and want to spend it on games. This is how markets work; they naturally evolve as demand and supply tease each other, and customers and providers jostle to get the best deal. Funny thing about that; it tends to also improve the product offered as well, as honest competition makes everyone bring their best product to the table at the lowest price. There are naturally growing pains as a market matures, but mature they do, even if some of the customers don’t. As Spinks notes, this is possibly the clearest measure yet for how much time in an MMO costs in real dollars. That cost has always been there, but it’s hugely variable. I, for one, welcome a clearer basis of comparison. That benefits the consumer looking to spend their money and the producer who wants to better understand what to sell. Until we have a socialist utopia where MMOs are developed for the Good of Mankind with no eye whatsoever on the monetary side, we’re going to have to deal with the business of games. More choices are a Good Thing, as they have a refining effect. It’s entirely possible some incumbents will be burned in the high stakes game. I’ve suggested it in a few comments recently on other blogs, and I’ve argued it for a while in one form or another, but I wanted to put a fine point on it for posterity. Let’s not call this a prediction, since I don’t think Blizzard will do this (it’s potentially a lot of work and has a few wrinkles to iron out), but I’d recommend it. The Cataclysm expansion is a perfect time for Blizzard to jump into the wider MMO market by diversifying their business model. The recent trend of formerly subscription-only MMOs converting to item shop microtransaction business models isn’t a surprise, nor is it a move of desperation. It’s realization that the MMO market is diversifying and maturing, and that the old ways of doing business aren’t going to work forever. * This is one counterpoint to my recommendation, actually. Blizzard might be angling for the wider market with their next big MMO project. Since that’s likely not imminent, though, I’m setting that aside, because the market is changing now, and Blizzard is oddly reticent to keep pace. With that in mind, the release of Cataclysm provides a perfect excuse both in lore and in business to make a significant change to the WoW business plan. What better time to break up the world than when a dragon is doing it for you? Specifically, I would recommend that they take the Old World of Warcraft (the content from level 1 to 60, sometimes called “vanilla” WoW) and break it off into its own product, literally breaking the game into pieces. They should then sell this like Guild Wars, as a single purchase that can then be played in perpetuity. They should then keep the “live” Cataclysm-era world going for subscribers. Players can upgrade from the Old World to the Live World, but not migrate backwards (maybe with some restrictions to keep gold sellers down, like no money migration). This could neatly corner the F2P market by outflanking the other big movers in the field, including EQ2X, LOTRO, DDO and even GW and GW2, while still providing the subscriber experience that current users are accustomed to. Of course details would need to be ironed out, and suits would need to be convinced. Kotick would need to be bribed or something. I’m convinced it’s not an intractible problem, though, and this may be the best time for such an earth-shattering, industry-shaking… cataclysmic business move. …though I must admit, if it didn’t prove to sell well, just like if Blizzard’s new MMO doesn’t do well, leaving WoW as the clear aberration that I think it is, well… I’d laugh.